Avocado chickpea salad might just be one of my all time favorite salads. First of all it has my two favorite foods – avocados and pesto. Once those two get together in one recipe I know it’s going to be a winner. 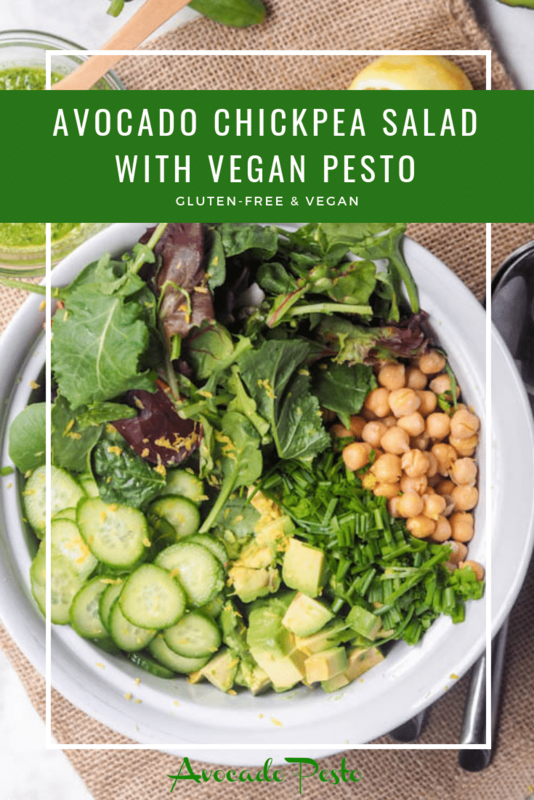 Since I purchased a food processor I have become obsessed with making vegan spinach basil pesto – not just for this avocado chickpea salad but also for my avocado pesto egg stuffed tomatoes (which makes for the best gluten free dairy free appetizer). If you do not yet have a food processor I highly recommend getting your hands on one – it’s my all time favorite kitchen gadget that I seriously miss whenever I am traveling and have to live without one. Let’s talk avocado chickpea salad. I’d been seeing a lot of these smashed chickpea avocado sandwich recipes online and figured it would be just as delicious in a salad with some vegan spinach basil pesto as the dressing. I mean pesto is just so so versatile if you ask me – it’s not just for pasta – it happens to make the best salad dressings too! Trust me you can do so much more with pesto than just add it to pasta. A dollop of that on a salad goes a long way and infuses the salad with so so much flavor. No need for store bought dressing at all. I normally either use olive oil on it’s own, some sort of infused Asian themed dressing or pesto as my salad dressing. Those are pretty much my go to 3 types of salad dressing. One of those seems to cover any type of meal occasion. 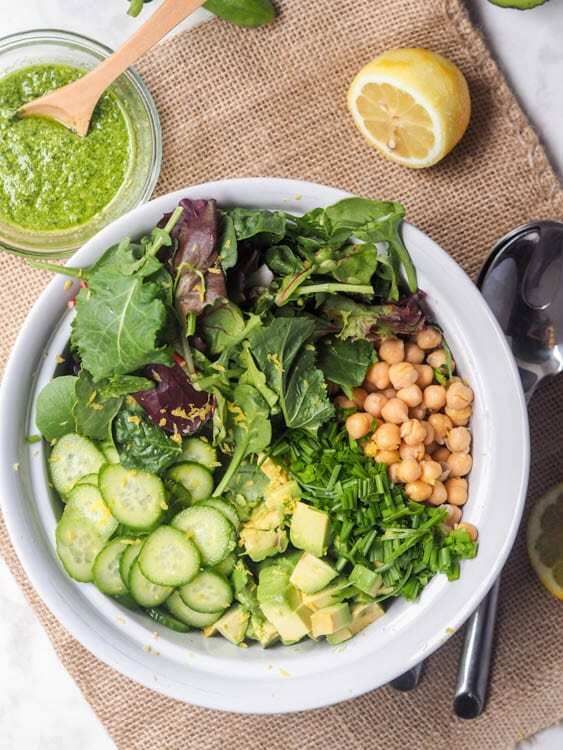 For a super green salad like this avocado chickpea salad the pesto diluted with a bit of lemon juice makes for the perfect dressing. This avocado chickpea salad has hands down become one of my all time favorite lunches ever. And I mean ever. 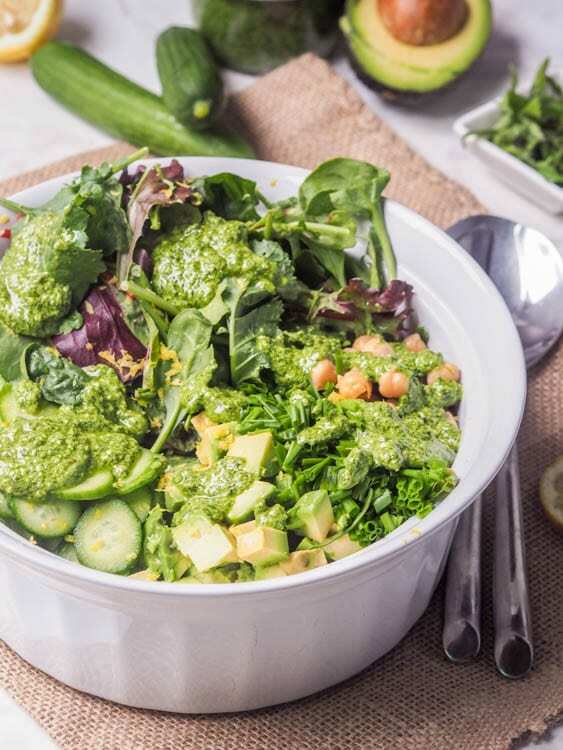 I mean come on, how could vibrant pesto, sharp salad greens, smooth and creamy avocados and healthy and soft chickpeas not make for a winner killer combination? High protein, low carb, vegan & gluten free. Healthy and delicious. You could also add in some optional mix ins – think thinly sliced red onions or cilantro. I love to first add a squeeze of lemon juice to my avocado before cutting it, to preserve that vibrant green color for longer and to add a bite of tangy freshness to the salad. If salads aren’t your thing use a potato masher to squash the chickpeas down a little bit and just spread between two slices of bread for a quick lunch of avocado chickpea sandwiches. I prefer this as a salad though – always overestimating how hungry I am and spending hours feeling stuffed afterwards – thanks to the filling aspect of both avocados and chickpeas. Best of all this is naturally gluten free and vegan when made with a vegan pesto. As long as you have a food processor (and I highly recommend investing in one – I love my kitchen aid 7 cup) this is a breeze. 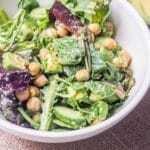 I hope you enjoy this chickpea and avocado salad as much as I did! This works as a great easy to make weeknight lunch or a perfect appetizer to bring to a grill party. 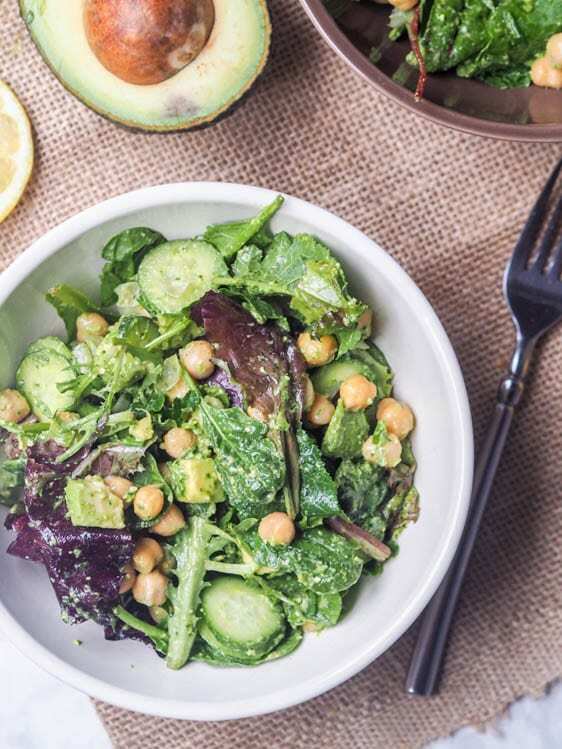 Summer time is grill time and salads + sides are always needed and this avocado chickpea salad will perfectly complement all the mains. This is simply one of those perfect gluten free vegan dinner or lunch recipes. Healthy and delicious. A win win. And if you love chickpeas in salads check out my vegan sweet potato and chickpea salad. Or for other vegan recipe ideas be sure to check out my round up with vegan zoodle recipes. I’m curious what’s your favorite gluten free and vegan quick meal? Does it include avocados and pesto as all my meals do? Leave a comment below to let me know what you think of my avocado chickpea salad if you end up making it! Quick recipe tip: if you’re making this recipe in advance hold off on adding the dressing and preferably add the avocados right before eating, just to prevent them from browning. 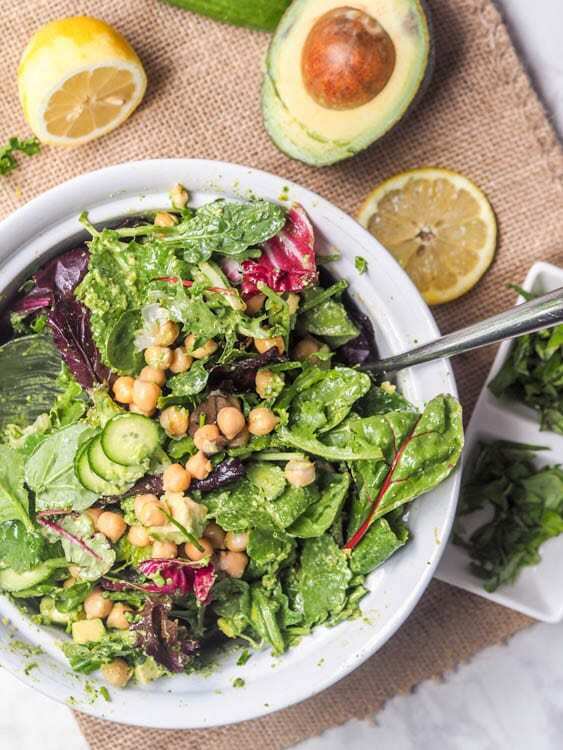 This avocado chickpea salad requires only a few minutes of prep time (as long as you’ve got the pesto ready) so I can’t imagine why you wouldn’t just assemble this the day of! KitchenAid KFP7I5 7-Cup Food Processor – though it costs a whopping $79 this is an essential tool in the kitchen, which can be used for making so many different things – sauces, dips, dough, etc. Once you have one it’s good for years so you only need to buy a good one once. 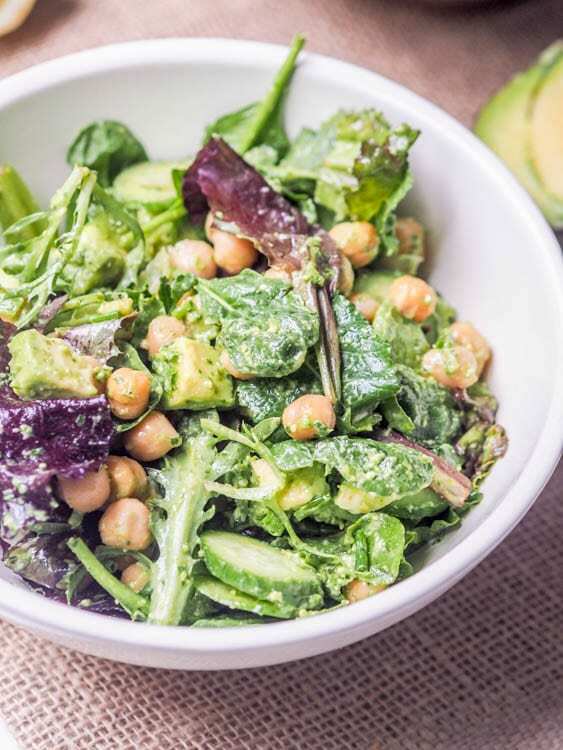 A delicious gluten free and vegan avocado chickpea salad with pesto. This vegan lunch or dinner recipe will be your new favorite meal! Squeeze lemon juice over cubed avocado. Combine ingredients in a large bowl and enjoy (mash chickpeas beforehand if using this as sandwich filling). It may have been simply thrown together, but there’s nothing simple about those flavors. It looks delicious! Thanks for sharing, can’t wait to try it. Let me know what you think — or if you add different ingredients how they pair together! Looks like there’s tons of flavor (and health benefits) in that bowl! Just what I’m looking for! And so simple to throw together! Avocado is a grand food to always add in the mix when the recipe permits. One of the major benefits I draw out of avos is their life sustaining properties. There is just no harm to having it as a daily dietary intake. Folate, Fatty acids, Oleic, help fight many illnesses including heart problems. High cholesterol can be significantly lowered within 5 to 7 days if avo is the main ingredient in your recipe. There are so many avo tricks out there that are just worth trying. SAAGA – South African Avocado Growing Association – is an avocado company and they host hundreds of avo tuck-ins. They are worth checking out. LIKE YOUR WORK AVOCADO PESTO! next time you come over I’ll make you some! We made this with fresh, organic basil from my green workplace’s on-site garden. 🙂 We unfortunately couldn’t help messing with it and added about 2t of hot sauce and it was thoroughly yummy! Hot sauce sounds like a great addition to the recipe! Will have to try adding it next time! I wish my workplace had an on-site garden! Lucky you! You had me at avocado. Then add chickpeas and pesto, I am there. This recipe sounds simple and delicious – on my must make list! So glad you enjoyed this and thanks for coming back to comment and let me know! Great idea to use kale instead of mixed greens — will have to try that next time! Where do I find the pesto??? Hi Debbie the pesto recipe is here: https://avocadopesto.com/2012/07/18/vegan-basil-and-spinach-pesto/ Enjoy! This could be dangerous. Love everything about it color, flavors, simplicity. Gorgeous ! Thanks! Hope you enjoy it if you end up making it! Have spent the last 7 weeks in China and have not seen a single avocado! Have definitely been missing them! Since I’m currently unable to have chickpeas I was prompted to find a replacement. While on the journey I ended up making quite a few different alterations…and I wasn’t disappointed! Being a little on the active side, I decided I need to amp up my protein/calorie intake since I took out the chickpeas. For this, I added Quinoa and broccoli. I also love the crunch and freshness that Cucumbers offer so I added some of that (peeled). Then I added some sprouts and used Romaine lettuce as my base. Finally, I decided to make my own creamy walnut pesto sauce with nutritional yeast. I used coconut milk as my base! Topped of with flax and chia seeds, this turned out to be perfectly crunchy, light but creamy, packed full of nutrients, loaded with good fats, and a great go-to salad before any rigorous activity. So, thank you for this recipe and also for filling my bookmarks bar with a bunch of other recipes I can’t wait to try! Thanks so much for taking the time to comment and can I just say WOW – you have really transformed my recipe into something that sounds even better than the original dish! Please please share your creamy walnut pesto!!! I have never tried making pesto with coconut milk but it sounds like a brilliant idea! I am seriously super impressed with the spin off my salad you created! Sounds delicious and I would love to make your version next time I get my hands on some quinoa (none of it here in South East Asia) but in the meantime I’ll send off these ideas to my mom to try at home! I love pesto recipes, and i can’t wait to try this! This was so amazingly delicious and rich. We had it with pasta but it makes an incredible spread on toasted squaw. I added a little garlic. Love this. It’s going to be a new favorite. So easy & quick. The hubby really loved it too. Thanks so much! So glad you both enjoyed this! Oh this salad looks so delicious. Really excited to try it. Chickpeas and avocados together are the best thing ever! I make a fabulous curry “egg”salad with the two. This salad is beautiful, I want it now! Best thing ever!! Hope you enjoy this salad if you end up making it ! Can u and me instructions for the pesto, it’s not included in recipie. To a food processor add basil, walnuts, salt, garlic, lemon juice, and hemp seeds. Process on high while slowing pouring the olive oil through the feed chute. Scrape down the sides of the bowls during the process. Add nutritional yeast and blend for another few seconds. Thanks so much! It’s one of my favorites!